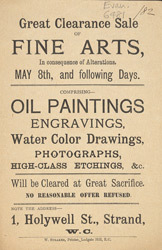 This leaflet is advertising a great clearance sale of fine arts. The sale consists of a variety of paintings, drawings, etchings, watercolours and photographs. Victorian art is characterised by its variety in style and format, paintings often showed scenes from ordinary life and featured people in sentimental settings and rural environments. Recurring themes were childhood, the plight of women, love poverty and old age.